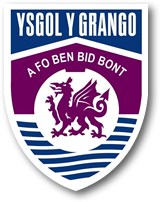 Welcome to Ysgol y Grango, an Outstanding Learning Community where the staff and students share a passion for excellent teaching and learning. It is a pleasure and privilege to present the school’s website to you and I hope the information presented will give you a real insight into the services that Ysgol y Grango provides for its students, parents and the community at large. Our school serves the environs of Rhosllannerchrugog and there are currently approximately 500 students educated at the school. We promote the values of respect, honesty and integrity, high aspirations and self-belief. We learn together and make the most of opportunities in lessons and outside the curriculum. Students are proud to be part of our school community and value the high quality of care and guidance that is available to them. We love learning and our students benefit from the support and guidance of a team of committed teachers. Our students’ happiness and wellbeing are our first priority. We enjoy working together to be the best that we can be. We are proud that our students achieve high standards across the curriculum and make excellent progress.